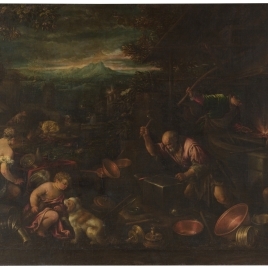 This painting is Jacopo´s first depiction of the passage from Genesis 6:20 and the only one in which the theme is treated separately rather than as part of a series depicting the story of Noah. Jacopo respected the biblical tale in terms of the number of people who were saved -Noah, his wife, and his three sons Shem, Ham and Japheth, with their wives- but took liberties with the animals. In some cases, such as the dogs, lambs and cows, he included more than two. He also failed to respect the priority of the lions in entering the ark, as they are preceded by an eagle and a wild boar. How realistically the animals are portrayed varies greatly, depending on whether or not they were a familiar species. Particularly striking is the artist´s ignorance of the lioness´ appearance, which has been depicted with a lion´s mane. The use of a ramp to enter the Ark, a common feature in illustrated bibles since 1480, allowed for a better representation of the full variety of species gathered around. Rearick has noted the existence of a number of preparatory drawings for the animals in Florence (Gabinetto Disegni e Stampe degli Uffizi) and Berlin (Staatliche Museen Preussischer Kulturbesitz), and it is reasonable to assume that this was the purpose of the sketch of a pair of rabbits (Uffizi, inv. 811). Noah and his family are shown in different roles. Whereas the patriarch´s gestures reflect his mission as recipient and executor of the orders of Yahweh, whose presence is merely implied, his relatives appear concentrated on their tasks and oblivious to any divine manifestation. Despite assigning the invention and much of the execution to Jacopo, Rearick detected the participation of Francesco and Giambattista. This is feasible bearing in mind how the bottega worked and the size of the canvas, although it has a uniform, harmonious finish. 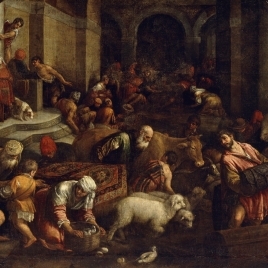 Some elements of the composition, such as the woman helping the first animal into the Ark, were reused by the bottega in a mediocre later version (Venice, Palazzo Ducale). 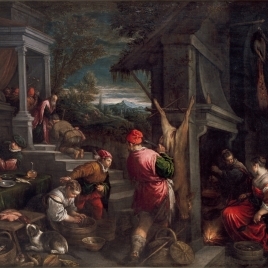 The only precedent for Jacopo´s treatment of this passage is Dosso Dossi´s Animals Entering the Ark painted around 1510 (Providence, Rhode Island School of Design). Both paintings show the same taste for anecdote, though Dosso took greater liberties, transforming the episode into a rural scene. It is no coincidence that both painters were regarded similarly by their contemporaries, for Dossi was also celebrated for his pleasant landscapes populated with peasants engaged in everyday activities. The thesis -upheld until only recently- that Titian acquired this painting for Charles V originated from a curious association of ideas. 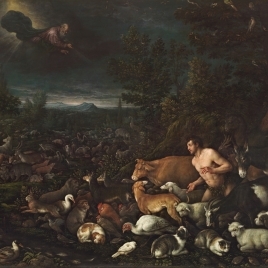 In 1648, Ridolfi stated that Titian had purchased a painting depicting this theme from Jacopo for 25 escudos, and since the only extant autograph version is the one in the Museo del Prado, which hails from the former Spanish royal collection, it seems logical that Titian would have presented it to Charles V, his most eminent patron. Eusebi was the first to make this assertion in 1824, and many historians followed. 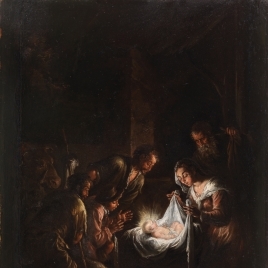 However, we know that the painting found its way into the royal collection by another route; it was most certainly acquired during the reign of Philip IV, probably from Crescenzi in 1634 (Text drawn from Falomir, M.: Los Bassano en la España del Siglo de Oro, Museo Nacional del Prado, 2001, pp. 224-225). Height: 207 cm. ; Width: 265 cm. Royal Collection (Royal Palace of El Buen Retiro, Madrid, “pinturas recogidas de las Casas Arzobispales”, 1747, nº 634; New Royal Palace, Madrid, “antecámara de su Majestad”, 1772, nº 634; New Royal Palace, Madrid, “cuarto de la serenísima infanta-dormitorio”, 1794, nº 634; Royal Palace, Madrid, “pieza encarnada”, 1814-1818, nº 634). Inventario Palacio Real de Madrid, III, Madrid, 1686, pp. 53. Eusebi, L., Catálogo de los cuadros que existen colocados en el Real Museo de Pinturas del Prado, Oficina de Don Francisco Matinez, Madrid, 1824, pp. 42. Ridolfi, Carlo1594-1658, Le Maraviglie Dell'Arte. Le Vite Degli Illustri Pittori Vene, I, G.Grote'Sche Verlagsbuchhandlung, Berlin, 1914-1924, pp. 391. Bettini, S., Quadri dei Bassani, Critica d'arte, I, Madrid, 1936, pp. 143-147. Arslan, Edoardo, I Bassano, I, Casa Editrice Ceschina, Milano, 1960, pp. 148, 170. Rearick, W. R., Jacopo Bassano's later genre paintings, The Burlington Magazine, CX, 1968, pp. 241-249 [242-245]. Wethey, Harold E.1902-1984, The paintings of Titian, I, Phaidon, London, 1969, pp. 168, n. X-2. Luna Fernández, J. J., Acotaciones a la serie de ''El Diluvio'' de los Bassano, Archivo español de arte, 175, 1971, pp. 334. Inventarios reales: testamentaria del Rey Carlos II : 1701-1, I, Museo del PradoPatronato Nacional de Museos, Madrid, 1975, pp. 42-43. Museo Nacional del Prado, Museo del Prado: pintura italiana anterior a 1600, Gredos, Madrid, 1979, pp. 224-225. Harris, E., G. B. Crescenzi, Velázquez, and the Italian landscapes for the Buen Retiro, The Burlington Magazine, CXXII, 1980, pp. 562-564 . Crawford Volk, M., Rubens in Madrid and the decoration of the King's summer appartments, The Burlington Magazine, 73, 1981, pp. 513-529 . Dizionario biografico degli italiani, 32, Istituto della Enciclopedia Italiana, Roma, 1986, pp. 185. Huse, Norbert, Venedig. Die Kunst Der Renaissance. Architektur, Skulptur, M, C.H.Beck, Munich, 1986, pp. 380, il. 297. Réau, Louis1881-1961, Iconographie de L'Art Chretien. T. I. Introduction Generale, II, Kraus Reprint, Millwood, 1988, pp. 107. Museo Nacional del Prado, Museo del Prado: inventario general de pinturas, Museo del Prado, Espasa Calpe, Madrid, 1990, pp. 198. Huse, N., The Art of Renaissance. Venice. Architecture, Sculpture, And, The University of Chicago Press, Chicago, 1990, pp. 331, il. 297. Rearick, W. R., En: Brown, B. L., Jacopo Bassano C. 1510-1592, Nuova Alfa Editoriale, Bologna, 1992, pp. 139-141, 158, 162. Checa Cremades, Fernando, Tiziano y la monarquía hispánica: usos y funciones de la pintura veneciana en España (siglos XVI y XVII), Nerea, Madrid, 1994, pp. 298. Checa Cremades, Fernando, Tiziano y la monarquía hispánica: usos y funciones de la pintura veneciana en España (siglos XVI y XVII), Nerea, Madrid, 1994, pp. 298, n. 126. 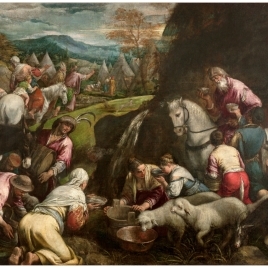 Ballarin, A., Il buon Samaritano di Jacopo e due mesi di Leandro Bassano nella Galleria del Castello di Praga. Jacopo Bassano. Scritti 1964-1995. vol. I, t.I, Bertoncello Artigrafiche, Padova, 1995, pp. 27-36 . Ballarin, A., Jacopo Bassano. Ritratto di levriero. En: Jacopo Bassano. Scritti 1964-1995. vol. I, t. II, Bertoncello Artigrafiche, Padova, 1995, pp. 377-408 . Bettagno, Alessandro, El Museo del Prado, Fonds Mercator Fundación Amigos del Museo del Prado, Madrid, 1996, pp. 263. Rearick, W. R., I clienti veneziani di Jacopo Bassano, Bollettino del Museo Civico di Bassano, 1996-1997, pp. 53-82 [72-73]. Berdini, P., The religious art of Jacopo Bassano. Painting as visual exegesis, University Press, Cambridge, 1997, pp. 86, 88. Habert, J., Bassano et ses fils dans les Musées Français, Réunion des Musées Nationaux, Paris, 1998, pp. 30, 87. Falomir, Miguel, Los Bassano en la España del Siglo de Oro, Museo Nacional del Prado, Madrid, 2001, pp. 27, 88-89, n. 9. Luna, J. J. ; Otaka, Y.; Kinoshita, A., De Tiziano a Goya. Obras maestras del Museo del Prado, The Yomiuri Shimbun, Tokio - Osaka, 2006. Martínez Leiva, G.; Rodríguez Rebollo, A., Qvuadros [sic] y otras cosas que tienen [sic] su Magestad Felipe IV en este Alcázar de Madrid, año de 1636, Fundación Universitaria Española, Madrid, 2007, pp. 102, 160. Gómez Cano, J.; Orellana Escudero, G.; Varela Simó, J., Las aves en el Museo del Prado, SEO/BirdLife, Madrid, 2010, pp. 42-43, 77-79,218. Ruíz Manero, J. M., Los Bassano en España, Fundación Universitaria Española, Madrid, 2011, pp. 61-64; 482, n.2jF, il. VI. Blanco, Miguel Angel, Historias naturales: un proyecto de Miguel Ángel Blanco, Museo Nacional del Prado, Madrid, 2013, pp. 76-79, 123. Vitagliano, Maria A., Painting and poetry in early modern Spain: The primacy of Venetian colore in Gongora's Polyphemus and the Solitudes, Renaissance quarterly., LXVI n.3, 2013, pp. 904-936 [924-925 f.3]. 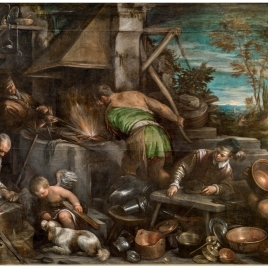 Falomir, Miguel, Titian, Jacopo Bassano and the Purification of the Temple, Artibus et historiae, XXXIV, 2013, pp. 275-284 [280, f.6]. Inv. Carlos III, Palacio Nuevo, 1772. Núm. 634. Catálogo Museo del Prado, 1854-1858. Núm. 703. Inv. Real Museo, 1857. Núm. 703. Bassano (Jacobo) / 703. El Arca de Noe. / El patriarca, rodeado de un sin numero de animales, los convoca para que entren en el arca, que se ve en el fondo, y hacia la cual van subiendo muchos de ellos. Entre los animales se ve esparcida la familia de Noé. / Este cuadro fue comprado por Tiziano y enviado á España para el Rey Carlos 1º / Alto 7 pies, 5 pulg; ancho 9 pies, 6 pulg. Catálogo Museo del Prado, 1872-1907. Núm. 23.